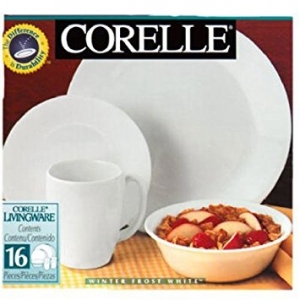 If you are looking for a great set of sturdy dishes and pans and bakeware you will want to get Correale Livingware Dishes. They are not expensive yet are always replaced should one crack or break. They are guaranteed for life. They wash beautifully both in and without a dish washer. Theys ell for under 30 diollars for a service for four people. They also have many different bakeware dishes. They have been in existence over 100 years and are so well priced , economical. that have a different design are mostly white. The deisgn is usually a blue flower or something else. They come out of the dishwasher with such a shine. simply run the hot water on them. They do however also have glass tops to the bakeware. The one thing bad is that when they are dropped by accident they shatter is a million pieces.